I recently purchased the book "Hard Crochet" by Mark Dittrick. The book was published in 1978, and documents a crochet technique using extremely tight tension and a small hook to create a very firm fabric. One of the projects in Mr. Dittrick's book is a Stetson-Styled hat. You can see the results here on my granddaughter. I'm keeping this hat for myself. Cool! I too created one of these! I tried to sell it, but no-one wanted to pay me for the time it took to make it, so I gave it to my father-in-law as a gift! He really likes it! Just got the book after running across your blog. I was wondering what yarn you used for yours. Also, did you wrap the hook, as suggested in the book? Thanks! Does it still hold up well when wet? Did you block it? Out of curiosity, which gauge did you use, 6.5 or 5 st/inch? 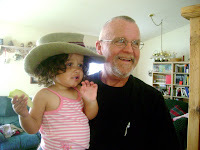 I haven't worn the stetson much to give any good feedback on it's durability. 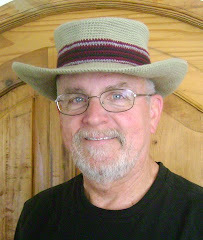 I do wear my new fedora quite often, and since going through the wash, it's as durable as ever. I TRIED blocking the brim as described in the book, but frankly, I think it actually softened the fabric compared to before blocking. I don't recall the gauge I used, sorry. Thanks for your comments. I'm happy to share what I've learned after 30+ years of crocheting. I'm still learning, but the way. It never stops. If you're on Ravelry, the fedora pattern is priced lower, since I don't have to send it to you, Ravelry takes care of that. Less work for me, less $$ for you. I *thought* that would happen. Must be a property special to the yarn he used. Thanks again! Yes, according to the book, it's a property of the "modacrylic" yarn that stiffens when blocking using the method in the book.